Bear with me while I'm still in México mode here on Cycle Chic. There was a slough of brilliant events and here's the tale of one of them. 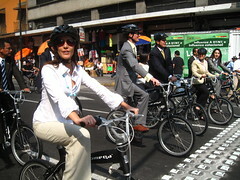 The exhibition Dreams on Wheels - Danish Cycling Culture for Urban Sustainability was opening in Mexico City, which was one of the reasons I was there. The exhibition is brilliantly curated by Thomas Ermacora for the Danish Ministry of Foreign Affairs. The Danish Embassy arranged for Prince Joachim and his French wife, Princess Marie to do the ribbon cutting. 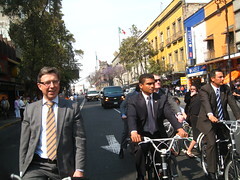 The event started with a little VIP 'bike ride' with the Royal Couple, the Danish ambassador, the Mayor of México City Marcelo Ebrard, the Environment minister for the city, Martha Delgado and... um... me. Strange but true. There were another group of dignitaries behind us and about 20 secret service boys 'protecting' us. All of us on bicycles. From the Mayor's office on Zocalo we rode down to the City Museum. The streets were closed off for the high security affair. I rode alongside Princess Marie and, about halfway along the route she asked me how far we were riding. I pointed up ahead at the waiting mob of press and smiled, saying, "not that far". We pedalled for abou 400 metres in total. On completely deserted streets completely and utterly sanitized for 'danger' and traffic by metal railings. Which makes the fact that the five others wore helmets a serious case of overkill. Indeed, the Prince, upon arriving at his designated bicycle, saw the helmet and muttered in resignation, "I suppose we have to..." Five helmets surrounded by dignitaries and security men without, on empty streets. Anyways, here are some photos taken by our photographer for the different events in the city, Kenny Viese. 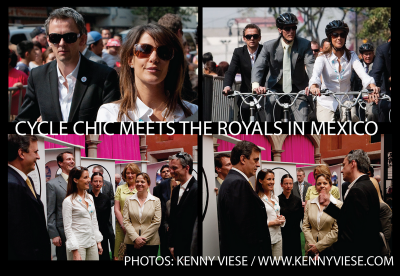 Me looking like a secret service-y kind of guy behind Princess Marie; the three of us rolling up to the Dreams on Wheels exhibition at the City Museum; and, in the two bottom photos, me giving the VIPs a guided tour of the exhibition. Upon arrival, there were speeches to commemorate the opening of the exhibition. I started the ball rolling, followed by Prince Joachim, Enivironment Minister Delgado and Mayor Ebrard. Then the ribbon cutting and the VIP tour of the exhibition. All in all it was fun. You get stressed by the pomp and circumstance and the prescence of a small army of security people, but at the end of the day it was a laugh. Here's the group of us stopped at one of three red lights on the bike ride [the streets were closed and we stopped at red lights...] and here's a photo of the charming Lord Chamberlain on the left and security guys on the right. Note the armada of cars, including an ambulance, following us. All in all it was an interesting, fun and good day for Mexican and Danish cycling culture and for Cycle Chic/Copenhagenize. Your Royal Highnesses, Mr. Ebrard, Mrs Delgado, Ladies and Gentlemen. Welcome to Dreams on Wheels – Danish Cycling Culture for Urban Sustainability. The exhibition has been shown in 18 cities in 14 countries, with many more scheduled this year. We are pleased that it has arrived in Mexico City. About 130 years ago a machine was invented. It has been called the most efficient machine in history. Poems, songs and books have been written about it. It transformed the face of human society within years of its invention. Liberating the working classes. Liberating women. Personally, I was pleased when I heard that the Danish Foreign Ministry had chosen the bicycle for this exhibition and for a symbol of Denmark. The bicycle is human. It is right there on the streets carrying Citizen Cyclists from A to B. It is the lead instrument in a human-powered symphony of movement. The soundtrack of a truly liveable city. The bicycle is a symbol of Denmark and Copenhagen and it's become a symbol of sustainability everywhere. It is people who inhabit our cities and towns. People that form the fabric of life. The bicycle is a fantastic tool for making our cities simply nicer places to live. We're proud to show you what we have achieved in Denmark. It is our hope to inspire. Thank you to all of our sponsors who have made this exhibition possible. Thank you to the City of Mexico City for inviting us and providing this amazing venue. Enjoy the exhibition. For more info about Dreams on Wheels. And the Dreams on Wheels Mexico website. I think there might be an unhappy mistake with the link to more info on Dreams on Wheels. It takes us to a car sales website. I'm pretty sure it wasn't what you meant. I was wondering if there's any chance the exhibition would come by Lisbon? Just another day at the office, eh Mikael? Seriously, congrats for getting the message out there and keeping it out there in so many cities around the world: I thoroughly enjoyed dreams on wheels when it came to London. Looking great, Mikael! Tak for sharing the high life with us little people. Do we have to call you Sir Mikael now? I think the Princess would look lovely in just about anything, but the first thing I noticed in this thread was the poor foot technique. Not good for her heels! And crappy for pedalling, even of a relaxed urban type. The original photo on this blog displayed proper "cycling in heels" technique (though unlike the subtitle the adorable red shoes were not high heels). Failure is one of the most feared words in business. In the investor focused market of today, failure can be costly. It is a creamy white substance specially created by worker bees to feed the queen bee throughout her larval and adult life.